CHILE: Chile has completed work to connect its two largest power grids, a move which should unlock huge potential for renewables in the north of the country. "Our country has ended the absurd situation of having one grid for the Upper North and another between Taltal and Chiloe," the nation's president Michelle Bachelet said at a ceremony to mark the creation of a single power grid. Uniting grids should result in more secure and cheaper power supplies. It will also facilitate investment in energy projects in the country's far north by linking them to the main population centres further south. It is expected to reduce Chile's generation costs by an initial $500 million annually, rising to $1.6 billion within a few years, the president said. The $700 million, 600km-long transmission line linking the grids was initially conceived by France's Engie to evacuate electricity from thermoelectric plants in the north. But Northern Chile's Atacama Desert is one of the sunniest places on Earth, boasting massive potential for solar energy. Its featureless high-altitude plains also offers opportunities for wind power. 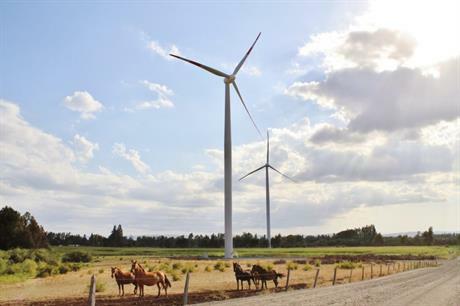 "It is going to encourage new investment because today we can now transport the electricity to the rest of the country," Chilean energy minister Andres Robelledo told Windpower Monthly. However, that will only be possible once work on a second line, strengthening transmission capacity north of Santiago, is completed later this year.